Wheel spinning governments, analytical pecuniary institutions and benign demand-based charities utter the inconsiderate benchmarks for what they consider poverty to be. They overtly say that 4 billion people on this planet live under or somewhere around the so-called poverty-line. A fiscal measure of living on, or below 2 dollars per capita PPP a day. And of course they must know, they are wise after all. A huge variable condition set by growing populations outpacing productivity ultimately leading to extreme economic margin. In times of crisis it is children and families wasting away; babies shrilling and emaciated souls lying curled up in filthy rags. It is in access to clean water, sustenance, basic medicines and shelter. Hyperlogic: if you innovate life saving, life subsistence, life enabling products, and then make and sell them at a frugal price that the very poor can afford and you still make a fair return, then you set off a virtuous circle. People at the bottom of the pyramid begin to climb the wall out of crisis. Well that is the first step in the frugal innovation equation. A further step is slightly – or fantastically – more ambitious: to innovate systems of technologies and tools that build basic infrastructure development that supplies clean water and foods, habitats and agriculture systems, etc, etc that the very poor can invest in through micro-loans and community pooling investors. ‘The Global Village Construction Set (GVCS) is an open technological platform that allows for the easy fabrication of the 50 different Industrial Machines that it takes to build a small civilization with modern comforts. Key Features of the GVCS: Open Source – Low Cost Modular – User Serviceable – DIY – Closed-Loop Manufacturing – Heirloom Design – Flexible Fabrication. OSE GVCS 50 include 3D Printer: an additive manufacturing technology where a three dimensional object is printed by laying down successive layers of material, just like a printer except in 3D. A 3D Scanner a device that can generate a 3D digital scan from a real-life object, where the file can be used to reproduce the object in 3D with a device such as the 3D printer or CNC Precision Multimachine. Linear Solar Concentrator an infinitely-scalable, linear device which concentrates solar radiation onto a linear target for generating heat or steam to produce electricity. From Frugal Consumers to Prosumers to Micro-Producers. All people are valuable. It is absurd to say otherwise. But more, for the countless faces that live in misery, they want to express their values, their worth, their creativity and not only in financially gaining ways. The deprived people I am talking about do not simply come to terms with their deprivation – because of the shear necessity of survival – they are born into poverty. Even without the sophisticated economic analysis, being a frugal consumer may give a slightly above subsistence position. What lifts the extreme poor out of poverty is individual productivity. By introducing frugal goods and services that give an element of production, whether in the form of device that can chill, heat, light, cut, clamp, secure, mend, make, energize, and infinite et al, the very poor not only stay alive, they have access to possibilities. There is an argument that the poor at the basement of the world’s economy are so very poor that 80-to-90 percent of the $2 a day goes directly on subsistence of foods, water, clothing, hygiene, but little else. Again, statistics can not only lie and distort, but simply do not give up the whole picture. If outgoings where devoted completely to survival needs, then how do they afford to buy even the most fundamental frugal possibility empowering goods? Simple wares that get them going? Think of it this way: rather than merely focusing on the poor as consumers, we need to view the ultra-underprivileged as prosumers with a long-term view as micro-producers. Because the only way to alleviate poverty is to raise real incomes at the bottom of the poverty hierarchy. And that means positive sum gaming. What products and service provisions can be innovated that set-up a positive feedback-loop that enables them not only to do well initially, but scales up very quickly and progressively to standards of income where individuals and families and local communities can develop thier homes and neighbourhoods? Set up first tear neighbourhood markets? From Make Do to Breakthrough. In the west, most startups catastrophically fail or slowly wind-up in apathy within the first five years. The reasons are manifold; no demand, no market, no rocket science, being the main! But in regions depicted by server scarcity, insolvency or otherwise, is not the same picture at all. According to a number of charities specialising in microfinance in the developing world, tell of a not so surprising story given facts. Microloan Foundation (below) has been helping small businesses for over 15 years with resounding success. They say that full repayment of such microloans is better than 97 percent among total loans (3 percent shortage being down to human fatality, disease, war or hardship). The unsurprised lies in the fact that people on the street of Darfur or Deffer, or on the islands of Malawi and Caltic, are not driven merely by an aspiration to acquire wealth or fulfil a dream or adventure, but stark reality. Survival of the fittest. Hunger, dehydration, a place to sleep and preserve. Fear and lack of voice and all the anxious knotted rest, drives their needs to start and make a frugal subsistence business. It means life or death (try teaching that at the London or Harvard Business Schools!). Frugal Microfinance is the supply of loans, savings, and other basic financial services to the poor for investment in frugal commercial ventures. Microloans in developed nations often go form $10-thousand dollars to around $50-thousand. Only, and now obviously, in a profoundly poorer countries and regions individual loans can be as little $100. For team or community ventures it can run to serval thousand. In rural India for example 100 dollars would be the world for an individual to buy a mobile phone, enabling through new mobile digital banking systems to receive wages and transfer money home to their family. During the 1980s, micro-enterprise credit concentrated on providing loans to poor women to invest in tiny businesses, enabling them to accumulate assets and raise household income and welfare. In the 1990s, many of these institutions transformed themselves into formal financial institutions in order to access and on-lend client savings, thus enhancing their outreach. The pioneering of contemporary microfinance is often attributed to Dr. Mohammad Yunus, who started experimenting with lending to deprived women in the village of Jobra, Bangladesh during his tenure as a professor of economics at Chittagong University in the 1970s. He would go on to found Grameen Bank in 1983 and win the Nobel Peace Prize in 2006. Big news is, bull elephant multinational corporations have over recent years been waking up to this fact. For one reason, there is a hefty golden purse at the end of this frugal rainbow. Think about it? If you could reduce by 90 percent the build cost of, say, a $2.5 million price tag of medical X-Ray machine, then with adjustments, it could be sold in developed nation at ultra-primus. A kind ‘reverse innovation,’ where frugal products ‘trickle up’ to the industrialized world. And believe me, in India, in as much as Africa and East and South Asia, the international corporation is beginning to reap new ground in the so-called Bottom of the Pyramid (BoP); referring (as above) to the ~4 billion people that do in reality earn less than 2 dollars a day. The original BoP concept was conceived by the late Prof. C.K Prahalad (CK) in his fabulous book The Fortune at the Bottom of the Pyramid. Here, individuals are largely excluded from formal markets, though they are often a source of untapped entrepreneurial energy. BoP markets are immensely diverse and fast growing productive sectors that engage people as a trinity of producers, consumers and entrepreneurs to reduce poverty and thus drive economic growth for local communities and indeed the provincial private sector. Multinational Corporate Lessons in Frugal Innovation. Beyond local BoP entrepreneurialship, large-scale multinational corporations such as General Electric (GE), Siemens, Heinz have invested heavily in emerging markets, both introducing high-value-low-cost technologies, and products/services; whilst seeking new found BoP opportunities. GE’s Welch R&D laboratory in Bangalore, India, is the biggest and most liberally funded outside America. Specialising in frugal medical devices such as is the Mac 400, a masterpiece of simplification: a hand-held electrocardiogram (ECG) with a artfully reduced number of features and controls found on conventional ECG kit. It has a simple bus ticket machine printer, can fit into a small rucksack, run on batteries, the cost of each test is under $1 and the price tag come in at around $800 per unit. I got curious, so whilst on a visit to my local hospital in Brighton, I saw an all-singing-and-dancing EGG machine that cost over £10,000, doing almost exactly the same job. Germany’s Siemens frugal thesedays; innovations in progress include: foetal heart monitors, solar-powered X-ray machines, wind power generators and road traffic management systems; all aimed at the BoP. Siemens pace is frenetic, generating ~30 percent of revenue in emerging markets, consolidating 30 manufacturing facilities in China and India over the past five years alone. And consider super-volume producers Heinz? They learned very early how to match products and distribution methods to local needs and values of merging nation consumer markets. Heinz's Emerging Country Food Ventures apply a rigorous frugal ‘4As’ program (see below) to score a new product's Applicability, Availability, Affordability and Affinity in emerging markets. Applicability matches local frugal needs and limitations to brand application. Availability identifies appropriate sales channels. Affordability reviews how to deliver the product at an attractive sales point. And Affinity equates to the expressed and often unexpressed intangible values to potential new offerings. If the 4As analysis suggest reasonable high scoring, managers then explore branding. Frugal product innovation must start in the company's GigaMindset. And remember that the BoP market has total collective market value of 2.92*1012 dollar value. Foreign R&D sites must integrated into the corporation as home nation innovation centers are. Yet people and resources dedicated to frugal innovation must be native to the emerging country(s). Local teams need decision-making authority to choose which products to develop, how to produce, sell and offer after-sales service. Further, profit and loss responsibility, which is often a prime obstacle for multinationals along with the sanction to draw from corporate global resources, which is essential for leveraging corporate assets in emerging markets. 1.The poor are not our target consumers because with our current cost structure we cannot profitably compete for that market. 2.The poor cannot afford and have no use for the products and services sold in the developed markets. 3. Only developed markets will appreciate and pay for new technology. The poor can use the previous generation technologies. 4.The BoP is not important to the long terms viability of our business. We can leave Tier 4 to governments and non-profits. 5.Managers are not excited by business challenges that have a humanitarian dimension. 6.Intellectual excitement is in developed markets. It is hard to find managers and engineers who want to work at the BoP. The Race to the BoP challenges conventional management wisdom; hence Fighting Poverty with Profitability in the BoP may seem a strange and contradictory idea. But if you provide people with life-enhancing tools and productive innovations at ultra-low-cost, then they will become more enabled, productive and efficient, and in turn people’s earning potential will increase. And the evidence is beginning to show that is possible to keep improving lives at the BoP by simply making this productive technology affordable and accessible. So how do both the would-be GigaEntrepreneur or corporate GigaIntrapreneur conceive and develop products or services that deprived folk living on thin air, embedded in extremely harsh physical and frugal environments, acquire and then enhance their lives in productive positive-sum ways? Well, there is one quite fascinating and heart warming answer: Gandhian Innovation! Gandhian Innovation is the conceptual brainchild of Dr Raghunath Mashelkar (Mash), a true visionary and accomplished chemist. Mash believes that India has the raw talent to drive and overcome challenges and become a nation of innovators, citing examples such as the Tata Nano, the lowest budget motorcar in the world at $2,000; a hepatitis-B vaccine which is one-fortieth the cost of convention drugs yet still meets UNICEF qualification; and the Arvin Eye Care’s cataract surgeries, performed on 300,000 patients ever year, at one-hundredth the fee charged in many countries. Gandhian Innovation is inclusive innovation: developing products and services that improve life for everyone; it is innovation that does not leave out the poor. It raises standards of living and quality of life. It is innovation that is not merely affordable, but extremely affordable. Not low performance at a low-price, but higher-performance at ultra-low-price. It is more from less for many. It is about questioning the unquestionable and seeking new way and new methods to achieve the so-called ‘4As’ of Available, Affordable, Accessible, and Appropriate. Mashelkar’s orginal inspiration for Gandhian Innovation came from the ‘Great Soul’ Mahatma Gandhi (महात्मा mahātmā) and his beliefs. Bāpu (બાપુ) Gandhi’s thinking can be translated into strategies for frugal innovation conceptualisation; then, in turn, a step-by-step method of development that match the demands of very BoP and emerging lower-price markets. Gandhian mindsets. To enable Gandhian creative thinking, one or a few should be immersed in BoP market environments! Sitting in a comfortable, yet sterile meeting room and brainstorming frugal market concepts is a million miles away from the BoP mindset. There is little excuse these days to go out walk-about rural South East Asia or accessible regions of Sub-Saharan Africa. The price of a plane ticket has fallen considerably, and do not stay in the Marriott (there’s one in Addis Ababa), stay in Hostels or better, under the stars. And no it is not anywhere near as dangerous as your limbic system is irrationally telling you. Immerse in BoP realties. There are keen reasons for this. First, where there is abundance the idea of frugality, reclamation and recycling has little significance (be honest!). Only, in times or in places of scarcity, aspiration is (needs) to be greater than reserves and supply (recall the sugar shortage in the late 1970s!). Hence, when people are rich in resource, ambition to progress and move forward goes quickly down. Therefore, resource rich firms are already at a disadvantage when conceiving and developing frugal systems. Here’s a tip: rent a shabby garage (al a Bill and Dave in the 1930s). No budgets for heating or air conditioning or food! Basic only! Frugal behaviour will only emerge by frugal realities. Gandhian innovation hierarchy. Life saving - life subsistence - life enabling - life possibilites. Frugal reality, not perceived benefit, sells at the BoP. And selling life enabling systems that the BoP can afford, assists in lifting the poor out of poverty. Move BoP consumers away from subsistence to possibilities. Thrifty appliances, economical tools or prudent communal systems move people above borderline existence to a life-of-possibilities. Beginning with access to the primary amenities of drinking water, notorious food-stuffs and basic shelter; the varying degrees of poverty; from extreme famine in sub-Saharan Africa, to the squalor on the homeless streets of London, requires different levels of frugal inventions that give access to possibilities. Does the provision function(s) live up to the customer’s expectations and demands? Is the ruggedized, easy to maintain and reliable? Is the provision simple and easy-to-use in regarding first-time usage? Does the market have significant volumes to achieve scale-economies and profit? Is the provision at Frugal price-point and offer value-for-money? A design for local emerging market or design for frugalinternational BoP markets? Frugal functions over multiple features. Minimum optimal viable features and functions Frugal products compete on ultra-rigorous price-performance criteria. But frugal product innovation is more than mere cost reduction. To deliver superior cost effective performance over a limited set of functions, business models often need to be reconfigured to create entirely new maker-techniques and supply systems. Hence, stripping down advanced products originally engineered to promote features for high-end markets will not make a competitive platform in emerging markets. Built in costs will simply not match BoP price-point targets and local competitors will run preverbal rings with correctly targets frugal functions. This analysis goes on in high-value products and service in high-end-markets. However, in BoP markets this takes on an altogether frugal sensibility. What is the bare minimum utility that will deliver the right level of effective usability and valuable end-product output delivery in ultra-austere environments? Examples: Portable, solar powered fridge, that operates at 3 degrees centigrade in all ambient temperatures – simple – no more, no less. Outdoor, portable, low-energy solar energized battery celled 6 hour florescent lamp – simple – no more, no less. One man, 2 kilo, ultracompact, water resistant, aerodynamic inflatable tent – simple – no more, no less (and then of course, it is quite possible to sell these three items in developed market, at higher-end prices). Local frugality. Products sold in emerging markets are tailored to local requirements. Product lines corresponds with the target market and customer segments, and identifies other potential products that would better satisfy customer requirements. In-depth profiles of the target markets/customer segments, buyer needs and specifications are used to build pricing and revenue models. This phase defines the frugal product’s functions and competitive advantages, discovered through expert interviews, cross-functional workshops and extensive market research. Identifies essential and non-essential functions to satisfy customer requirements, estimates costs using different technical and engineering approaches to produce the components, then uses a cost/performance matrix to derive design options. Breakthrough cost mindset. Okay, your board has asked you (or maybe you the Entrepreneur) to reduce the direct cost of your shinny best selling Dynamic-X product by 90 percent. Not 10 percent, but by ninety points. Believe me, when I set this challenge in my assignments, almost every time I am greeted with ‘impossible’ (and other expletives). And that is the breakpoint. If you were challenged to act such a scale down in costs you would naturally think in your relative local terms. And of course that would be completely restraining. But by thinking as a corporation would, systemic transformational changes and ideas you will envision and then set the solutions to achieve such seemingly impossible goals. So want to reduce your brainchild’s marginal cost by 90 percent, live and design in Manabí or Bangladesh. Further still, if you were to design from scratch a product that the best competitor produces for a 1000 dollars, and your target make was Sub-Saharan Africa, and your price target price was at best $5. No doubt 99 percent of reasonable humans would pull out and leaving the nutty one percent to get on and fail. But such radical breakthroughs in cost happens on the unreasonable frugal fringe. Robust design and ease of maintenance. Jungle Commando-like ruggedized and anti-use-abuse is a must. You know the old saw ‘Why don’t they make airplanes out of the stuff that the Black Box Recorder is made of?’ Where possible, maintenance free or in service maintenance that is a breeze for the novis with no tools. Again, there are no maintenance workshops in the desert. So use the latest design for rugged environment and reliability techniques (Six-sigma, TaGuchi, et al). User-friendly Gandhian design. Intuitive user-interfacing through design intent from first encounter and usage of the service/product must be high on the design agenda. Remember the gadget will be used in the jungle, wilderness or hot conditions. It is dark, noisy, monsoon drench wet. It is wind shear minus 30. There is no one to help, no manual, no go-compare website, nadir, nooooo-thing. One trick designers use when thinking about instinctive user interface design is the toddler technique. If a three year old can use it without instruction, you are on a winner. Take the lid off a Jam Jar or turn off the TV? Think about it! Design physical products for fast turnaround services. This enables companies to reach greater numbers of ultra-low-income consumers. They might not be able to afford the product, but rent it for a couple of hours/day/week. Gandhian production systems. A rethink of the entire production process, often turning business models on their heads. As with the necessary frugal mind set need to get the build cost of physical product down to extraordinary low costs, the same must be applied in production. Instead of mechanical fixings – use anaerobic adhesives and snap fits. Instead of complex systems (compressors) – use low cost cooling fans. Instead of premium material stock – use refurbished substraights (reclaimed polymers and steels). Instead of complex fragmented assemblies – use origami methods for integrated assembly design. I could go on, but once again, this comes down to a creative and in turn innovative frugal mindset. Go to the poorest regions in the world, take and read books about Bāpu Gandhi, and you will feel it. Gandhian (Trogon) Distribution. One of, if not the preeminent killer diseases in overpopulated, underdeveloped nations is dehydration through diarrhoea from drinking contaminated or spoilt water. This veracious disease can be quickly halted by a combination of rehydration salts and zinc tablets. But distributing such inexpensive remedies to remote third world regions is (was) not easy. That is until Simon Berry, a health worker in rural Zambia, noticed that even though it was almost impossible to get medicines to remote regions, Coca Cola was obtainable almost everywhere. So he had a brainstorm and designed a package for the salts and zinc - ‘Kit Yamoyo: Kit for Life’ - that sits between the Coca Cola bottles in the distribution crates. Berry and his wife have now set up ColaLife, and have embarked on rolling the distribution idea out in other remote regions. It is not too difficult to imagine other major corporations, like Coca Cola, that can be used to piggy back emergency and subsistence goods and medicines quickly to isolated quarters. Think Trogon! Ultimately Gandhian Innovation, Frugal Engineering and the Race to the BoP goes way beyond method; it is about a GigaMindset in the context of turning people’s lives around in a way that no government, no demand based charity, no percussive institute, no United Nations power pack, no peace armada, no priers, no three wishes can do. It is about developing untold GigaMarkets that ends the BoP. Once and for all ending abject poverty. And remember the better the return for the frugal GigaMarkets, the more successful, more enabled, more independent, more progressive the people who have suffered at the BoP will be. But most of all – and think about this - what a paradox!!! Do not adjust your TV-set, you are about to enter the Twilight Zone: This scary-tale begins with a man that has passed-on and gone to Heaven!? He has entered a starlit paradise that’s full of his greatest loves and heart’s desire: chock-a-block with luxurious Casinos, sumptuous Hotels, lustrous Yachts and performance Cars. And no matter what he does, he wins and triumphs and guzzles down luxury, time and time again. He attracts the utmost gorgeous, most beautiful, intelligent women at the drop of Margarita. The cuisine is fabulous, the Champaign sublime. His home elegantly styled, where everything he could wish for is served in an instant. Then one night, sitting at a bar in one of the Casinos, with his head in hands, he confessed to the Barman that he was on the edge, fatigued and out of his mind. ‘I just don’t get it. I win all the time. Where’s the challenge in that? I thought that Heaven was supposed to be – well – Heaven!’ he sighed. The Barman turned, came closer and stared him darkly in the eyes, ‘What not on earth makes you think that you are in Heaven? Well, it is not all strange fiction here, because it can be a similar nightmare for the extraordinarily Rich. It would be too thin to say that extreme wealth brings the onset of emotional riggermortus. Clearly wealth gives incredible access; as the extremely well-off experience a life-style that 99+ percent of people never get to dream about. Maybe for the Nuevorich technologist and real-estate mogul and tycoon on the 24 hour go, a respite would be a windfall. Yet for the majority of inborn families or executive spouses, such pervasive admission to the utmost everything, anytime, often turns into another day merely falling off the calendar around the pool. The UberMarkets by the Numbers. And the GigaNumbers hold up; as the sum of GigaPlutons, GrandOligarchs and TechnoEntrepreneurs is on the way up! And considering the asymmetric productivity gains we whitness, the rich are about to get even richer. Even as much of the world today experiences anaemic economic growth and the BoP continues to suffer wide spread ills, there are now more billionaires than at any other time in history: totalling 1,396 according to Forbes Rich List May 2013; combining a net worth $5.429-trillion. That is just 1,396 people owning 7.9 percent of the world’s ~470 trillion capital asset economy. These ultra-rich are surrounded by ~25 million super-rich millionaires. With approximately 175,000 millionaires in Asia; 185,000 MegaAires in the Eurozone; not to mension the USA boasting the most with well over 5-million millionaire households; and then of course not to begin to bring up the fact that there is on order of 500,000 new millionaires in the making each year; that begins to say a lot about the potential GigaMarkets here! In view of all this, a recent study by the World Institute for Development Economics Research of the United Nations (WIDER-UN) made the revelation that 1-in-10 household’s account for almost 85 percent of the world’s primary assets; and even more profound, that one-in-100 of the world’s citizens (70-million) account for almost 40 percent of total asset wealth. The WIDER-UN report considered monetary assets such as real-estate, investments and auxiliary assets such as pensions, nest-eggs and capital inheritance and savings. Together, this totals $125 trillion in tangible assets globally. Take the United Kingdom, a wee nation of small Isles with a population of a mere 0.9 percent of the world’s population. Tiny, yet have a total of 77 £billionaires, which accounts for almost 8 percent of the world’s total GigaAires. The top 1,000 wealthiest Brits have a combined worth of £414bn. No surprise that Leading British entrepreneurs saw their wealth increase in 2012; JCB’s Sir Anthony Bamford, saw his fortune go up to £3.15 billion and the Vacuity inventor Sir James (JD) Dyson’s wealth increased to £2.65 billion. Roland Berger Strategy Consultants ‘Chinese Consumer Report – Luxury: A brand awareness up grade welcoming a new era in Chinese luxury market’ makes clear, Chinese consumer are craving for luxury goods as growing numbers of the well-heeled and elite are enthusiastically taking up the lavish and seeking brands popular in developed economies. This in turn has not gone noticed by the mainstream luxury brand producers. Seeing their products become a characteristic of everyday life in China. Luxury merchandiser are capitalising on and developing an acute understanding of Chinese high-end consumers. Again this can be seen in the numbers, as Chinese luxury clientele are expected to account for ~40 percent of the global luxury-end market leading up to 2016. In fact, there, luxury is one of a few commercial domains that have grown reliably over the last decade; in many cases not merely grown, but have boomed. Such top-end GigaMarkets are not hard to define. Clearly the basic criterion is income generation in excess of $1-billion. Clearly there is valuable treasure here. But what is it that they, the rich, actually do, play, go, consume? In precise terms, what UberInnovations exist? What guise and form do they come in? Well, there are plenty of examples of luxury markets, ranging from select apparel to elite appliances to extraordinary architecture to high spot transport and much more; all aimed at the superrich. A much mooted term at present is Uber; hip for extreme often to a point of obsession. Sometimes used as a prefix for emphasis of superiority. Thus, UberInnovations, as you might imagine, exhibit UberValue, commanding UberPrices. UberInnovation attracts the extremely rich, the excessively powerful, the exceptionally famous, and in many cases the extravagant and prosperous corporation. UberInnovation is sold in low-volume and often exclusive one-offs. UberAccessories from a design perspective, is a good preliminary here. One of my penchants is the Dubai-based jewellery company House of Mouawad's ‘1001 Nights Diamond Purse,’ which comes in at a confounding $3.8million. Designed to mesmerize with lavish attention to detail and elaborate workmanship, it spins one’s head just looking at the wonder. Encrusted with over 381 carats of diamonds, a heart-shaped bag dons 4,517 diamonds (105 yellow, 56 pink and 4,356 colourless) it took over a 1000 hours to finish. Another sort-after exclusive is the work of Chopard, the Swiss luxury jewellery Brand. For starters, they have created the world’s most exclusive wristwatch. Labelled at 25million dollars. Which is, to say the least, an ultra-extravagant timepiece. This magnum-opus is decorated with three heart-shaped diamonds: a 15crt pink diamond, a 12crt blue diamond and an 11crt white diamond. To take the design to UberBling status, they lavishly and painstakingly attached 163crts of white and yellow diamonds to take the cache to 201crts. Chopard make many of their watches and movements in-house rather than using the ebauches of other designer. To their credit, Chopard participates in the ‘Qualité Fleurier’ standard that competes with the celebrated Geneva Seal standard. With boutiques in Geneva, Manhattan, Beverly Hills, Costa Mesa; and thousands of authorized retailers in chic, high profile locations. Then of course there is the $100,000 Zafirro Iridium Razor! Is it an UberAccessory or something you shave with? With blades are made of gem-stone sapphire; with edges less than 100 atoms across; 5000 times thinner than a strand of human hair. The handle is made out of 99.9 percent pure iridium (one of the rarest elements on earth), all held together with 99.95 percent pure platinum hexagonal screws. Clothing is another fixation with the rich. Hence, UberApparel includes threads with exclusive access; designed for the financially privileged: The Million Dollar Dandy, as on example, is a decadent slice of English society. Starting at $1,000,000 each, the Million Dollar Dandy was conceived by Frosdick of London to meet the needs of a privileged world traveler who thought he ‘had it all’ but struggle to maintain an inventory of clothing and footwear to meet the demands of varying climates, business, social and leisure occasions. In the same vein, Lady Gar-Gar’s 2012 Winter Collection was put out for option two months before launch. Each garment is a limited addition of one-hundred items. Each garment’s price tag is around 25-thousand dollars. And do you know what? With a few days each garment put on option, it was oversubscribed by 1000 percent. Stop the bidding please! Hungry? Almas Caviar is UberFood, coming from Iran, is tremendously scarce and expensive. It can be purchased at Caviar House & Prunier, in London, that retails a pound of Almas Caviar in 24-karat gold can for $25,000. It is also where you can seek the most high-priced supper in the UK. Italian White Alba Truffles - the king of fungi - are especially high-priced as they are also not easy to cultivate. A true delicacy at $160,406 for a gigantic truffle; reportedly the world’s most expensive ever, weighing in 3.3 lbs. Then there is Blackwood Distillers Diva Vodka at $765, 000, filtered through charcoal and gem stones; then ther is the most expensive libation on the planet the $1,500,000 a jug Blue Agave Tequila contained in a platinum, diamond-encrusted bottle. Next, the wealthy need to relax, so UberElectronics ranging from elaborate pocket gadgets to gulp-size 18cts gold plated TVs, whopping amounts hard cash is exchanging hands. One enterprise leading the way here is the much acclaimed Goldstriker International, sitting at the heart of select UberLuxury. Based in Liverpool, UK, a city with a legacy of world-class music and arts, Stuart Hughes and his wife Katherine expertly and artistically clad precision engineered tools and toys like iPADs, Swish timepieces, Smartphones, Video Game Consoles and ornate Chess-sets with gem stones and precious metals. Their concept is simple: let technology embrace luxury in precision. History, designed and crafted with 12.5cts of flawless diamonds, 53 individually set sparkling gems, a solid 24ct Apple logo and the rear section produced again in 24cts gold. The front bezel has been shaped using rare and valuable opal-like organic Canadian gemstone Ammonite. And too really rub it in, segments of 65-million year old T-Rex dinosaur bone has been fractured and splintered into the Ammonite, then finished off with a platinum inlaid 8.5ct gleaming diamond, bounded by twelve lateral flawless lozenge diamond rocks. Yet even Stuart Hughes’ regal endeavours are only ripples in a vast current of ultra-extravagant UberInnovation. 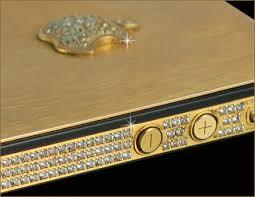 A flurry of majestic exemplar flourish, including the £692,000 ‘Diamond Crypto.’ One of the most expensive Smartphones available today. The case is cast with solid platinum-950; each side has 25 half-ct diamonds, embellished with 5 royal blue rhombus diamonds. Then when it comes to UberArchitecture, billionaires tend to be as opulent as they are elaborate as they are innovative. And this is what happens when GigaDesign meets un-abandoned structure and a billionaire's ambition becomes a home. Fashioning a home for billionaire life-style comes down to understanding how various elements complement one another in the GigaContext. For instance, at Cutler Anderson Architects (CAA) - the designers behind Bill Gates's high-tech dwelling in Medina, Washington State - designing a home for one of the richest men in the world money should not play a part in an architect's design philosophy. Instead Holistic insight plays a vital part in their design thinking. CAA appreciate the nature of the elements, the landscape, the flora and fauna, the materials so that they can bring something that different yet acceptable to the pallet of billionaires row. Then there is the $1-billion 27 storey tower in Mumbai, built for Mukesh Ambani, the 4th richest man in the world. Russian oligarch Roman Abramovich purchased all nine UberApartments in two adjoining buildings in the Knightsbridge neighborhood of London and plans to transform them into a mega-mansion at a total cost of about $230 million. Further still, Beijing architects MAD Architectural Design Studio are developing the 400,000 square meter Sanya Phoenix Island in Hainan, China. Upon completion, the Y3 billion development will feature six luxury apartment buildings, a five-star hotel, conference centre and a signature seven-star hotel. On top of that, their Fake Hills housing development will be located along the coast near Beihai. The designs feature towers in the shape of amoeba-like hills, referencing the hills in the local area and low-rise buildings on the water-front. For obvious reasons, UberHotels are not springing up everywhere. They are rare; they are Uber. One exclusive exemplar is Abu Dhabi's Emirates Palace Hotel, offering the 'ultimate holiday experience.' A luxurious seven-star hotel packaging the world's first $1million holiday; an eye-wateringly seven-day break for two people. The Imperial Suite at the President Wilson Hotel, Geneva, is a penthouse reached using a private elevator; with four bedrooms, six bathrooms with mosaic marble floor and a terrace with a dramatic view overlooking Lake Geneva. Decorated in a contemporary style, with marble and hardwood floors; the living room has a billiards table, a library and a cocktail lounge which can accommodate 40 people. The dining room seats 26 people around an oval mahogany table. The hotel’s staff reassures guests that the security in the Imperial Suite is among the best in the world, ideal for celebrities or travelling heads of state who visit the United Nations headquarters next door at the Palais Wilson. If you are, or know of a leisure marine aficionado, then Uberboats might make a jolting impression. The most exclusive sea-craft I am aware of is a gold-plated super-yacht, valued at an astounding $5-Billion, and said to be the most expensive on the planet. ‘The History Supreme,’ once again, is designed by jeweller Stuart Hughes; putting Roman Abramovich's Ritz-like 100 metre ‘Eclipse’ vessel into the shade. The craft is decked with one hundred tons of gold, lofting half its exterior. The sleeping cabins are wrapped in platinum. The deck, dining areas, and anchor are made from precious metals. The 30 metre craft, which has been billed as the world's most unique yacht, has the Hughe’s finger prints all over it, typically displaying a statue made of Tyrannosaurus Rex skeleton. And if that was not sufficient, a GigaMonster lurks on the horizon: the ‘Streets of Monaco’ super-ship. A $1.1billion private yacht consisting of substantial eastern citadel architecture, sandy beaches edging a blue lagoon, a Monte Carlo Casino hall, a dwarf versions of the state’s famous Monte Carlo racetrack; as well as swimming pools, tennis courts, cinema, go kart track, and the chic ‘Hotel de Paris.’ A hyper-reality, billionaire's playground on a private sea cruiser. That was boats, what about planes? There are private jets and private jets, then there are UberJets. Airbus has staked a claim to be the world's number one aircraft maker after it notched up a series of deals at the Paris air show. It received an order worth $16-billion for 180 planes from India's low-cost carrier IndiGo. According to reports the IndiGo order will be followed by another huge deal with Malaysia-based AirAsia for 200 of the same aircraft, thought to be worth $17-Billion. However, that is not Uber, that’s just another day at the office. But a crown head of an Arabian state has requested a 'Flying Palace.’ The Super double-decker A380 airliner is about to become the world's biggest private jet. With a price tag in excess of $300 million, the final design is one of sear opulence, splendour and panache. Add four-poster beds, a Turkish bath for four and somewhere to put the Rolls-Royce; not to mention a boardroom with holographic screens and a concert hall. A lift shuttles between the plane's three floors, from the private quarters upstairs, down to the concert hall, featuring a grand piano and seating for ten, and to the garage below. Its fabulously wealthy owner is unknown, but names linked to the plane include Saudi Prince al-Waleed bin Talal, owner of the Savoy Hotel. The interior is being put forward by the British firm Design Q. In a space fit for 600 passengers, the design has plenty of room to provide 7 star accommodation. Everything a billionaire would want. It gets crazier! Entre: UberEvents. Like a ringed steel fence, the ordinary man cannot reach. Would you pay $25,000 for a Beef Stake. 2011′s Super Bowl XLV saw the most expensive Super Bowl buffet in the world. Manhattan’s Old Homestead Steakhouse took over one lucky person’s kitchen on Super Bowl Sunday. The steakhouse’s executive chef, Oscar Martinez, prepared a finger buffet. The main course was sirloin steak covered in black truffle shavings on toasted baguettes and chicken wings covered in horseradish and topped with Beluga caviar. But that is the UberWorld and that, in fact, barely scrathes the surface. Actually, the most expensive outdoor event in history was The World Expo 2010, Shanghia. Lasting some six month, some 70 million people saw 253 pavilions from 192 countries. The world's first emerging nation to host a world fair ending up creating the largest ever. Beijing officially claimed they spent the equivalent of $4.2 billion to host the event. Yet add in all the amounts poured into infrastructure and other preparations, and the cost balloons to more than $58 billion. Call it the most expensive event in history. And if you think that is extravagant, then what about my own experience in UberClub land. For me it was giddy experience. In 2007, I was invited as a guest to an UberExclusive party in Malan, Italy. As a dim-witted author, I felt quite deferential. Royalty was present, pop stars and movie actors too. The DJs first division and the keynote stage performance the 70’s disco icon George Clinton. And the fries did go with a shake! Drinks were gratis for me (thankfully). A bottle of some obscure Champaign, whose name I cannot remember, was prices at 2,500 Euros. And when I was informed the door fee, I blushed with disbelief. Parties and nights of this ilk go on all the time, all over the world, in the most luxurious, exquisite locations. Only, most people hardly ever hear of, let alone experience, such grandiose highjinks. The reason is that such zenith venues are carried by secret word-of-mouth invites. Yet, if so inclined, one can indulge, if one cares to seek such UberExperiences. And you might have guessed, Sin City would be a good place to start. Gleaming hot spots at mind-boggling prices abound Las Vegas. In particular, the world's most expensive nightclub: 3131 Las Vegas Boulevard. It is free entry, only the cocktails retail at $10,000. Try ‘The One.’ A blend of vintage Dom Perignon and a shot of Louis XII Remy Martin Black Pearl cognac, splashed over a quantity of gold charms for keepsake. The club itself is a betwix of Roman Caligula, Camelot, Crown Jewels and Psychotropic Hedonism. Peering at such extravagant UberStuff and UberAffairs, at least to the average someone, may seem astounding and beyond belief. But as sure as golden eggs are eggs, thousands of UberOutfits and their wares are emerging the world-over at an ever faster rate. And there are stark reasons for this trend. Then there is the jaded Heaven syndrome (cited above). Rich people get fed-up! They have a profound psychological precondition to have it all, and I can tell you, they have it all, and all, and all; to the point of trance like dullness. So, Uber seems one of the very few stimulants that jolt them out of their stupor. Next, there is the GigaBusiness deal and mercantile capital investment transaction often involving ceremonial-like contract sign-offs. This happens every day in the big investment banking world. All the president’s men gather to sign in blood. In turn, they receive commemorative plaques and gilded gratuities that reflect the UberStatus of the venture. And who do you think buys 26 UberWatches in one batch? Who rents a tropical island for the weekend with 26 double hotel suites? Again, it happens all the time. Ask Richard Branson! Clearly, UberInnovation is one of the major archetypes of GigaMarkets. Individual markets cretin in the area of a billion and more; collectively the amount to 100 billion dollar industries. In total, no doubt trillions in worth. There are barriers to entry; investment finance being a major one. But as the above examples prove, UberInnovation is serious root to GigaValue.